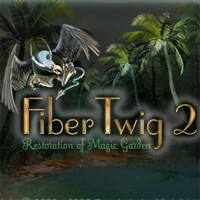 More magical mental fun in this long awaited sequel to the shape-matching puzzler, Fiber Twig! Assemble missing twigs to restore beautiful fairy-tale patterns. But now you don't have to do it alone! Choose from three unique characters to help you out along the way and upgrade their skills as you go. Featuring the same stunning quality as the original, Fiber Twig 2 is an enchanting puzzle for the entire family!